Join us for a fun-filled summer event that celebrates the extra special bond we have with our four-legged friends. Bring the kids! Bring your dog! It’s FREE for all the family to enjoy. Join our Facebook page for event updates. We’re delighted that there will be an RAF flypast for our Fun Day this year at 1.45pm – a great way to mark our 30th Anniversary and a sight not to be missed! Every dog’s a winner in our eyes, but we like to have a little fun with our four-legged friends at the annual Dogs for Good event. See classes below and awards take place throughout the day between 11am and 3pm. See a member of staff on the day to register your dog for the appropriate class and find out what time the judging takes place. Best of luck! Bring your dog along to see how you fare at the dog agility course and flyball (team relay) activities. It isn’t Crufts and there are no judges, this is purely for fun! If your child loves dogs, they’ll love the Dogs for Good Fun Day. There’s plenty to keep little ones entertained including Splats Circus workshops, craft activities and face painting. Children of all ages are welcome to enjoy the activities for free, although there is a collection bucket for voluntary donations. 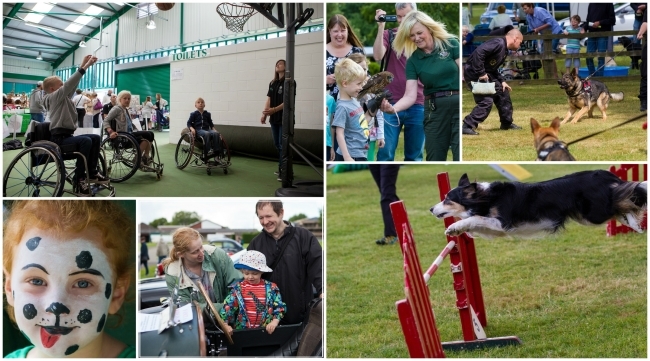 One of the most popular events at the Dogs for Good Fun Day – every year – is our Sportzone. We bring disability sports to the show for everyone to try, disability or no disability. There’s ample space for kids to play all day if they want to and our instructors love to share the joys of their sport with grown-ups too. Come along and chat with them, watch the fun or join in. Who’s up for an adrenaline rush? It goes without saying that we love dogs, but our compassion extends to others creatures too. That’s why Fir Tree Falconry will have a selection of feathered friends for you to meet www.firtreefalconry.co.uk. Get close to a Hawk Owl, Kestrel, Harris Hawk, and an Indian Eagle Owl — if you’re brave enough! In return for a voluntary donation, these magnificent birds are tame enough to be stroked and even sit still for a selfie. Browse an array of stalls featuring handmade crafts and goodies. There will be plenty of gifts for your four-legged friends too of course! No Dogs for Good Fun Day is complete without our very own demonstration team. Watch our team of specialised dog trainers direct our dogs to pick things up, push buttons, pull open doors, and even help them get in or out of bed. Don’t miss it! The Fun Day is FREE to attend, but we suggest a £3 donation for parking your car and encourage you to give a voluntary donation for the activities you take part in. Please do not leave your dog unattended in the car. If you don’t want to bring your dog inside the event, please leave your dog at home. Delicious food, hot and cold drinks, plus snacks are available on-site. If you need any help with arrangements or would like to ask a question, email [email protected] or call 01295 252600. If you need assistance on the day, please approach any member of Dogs for Good staff who will be more than happy to help you. Dogs for Good brings trained dogs and people together to help them overcome specific challenges and enrich and improve the lives of both.